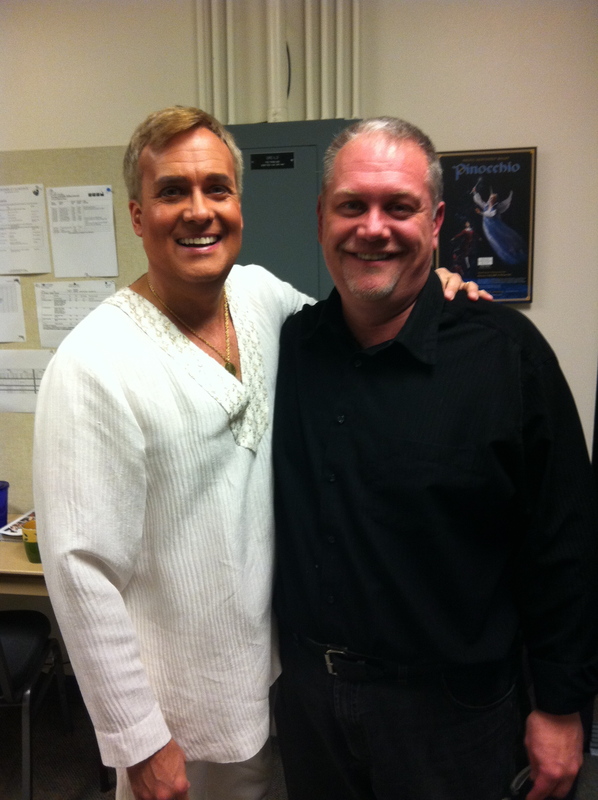 With the amazing Bill Burden, opening night of Seattle Opera's "Orpheus and Eurydice"
My job at the opera is so much easier and lots more fun when a favorite singer is part of the production, and at the top of my favorites list is tenor Bill Burden. Bill has one of those voices that is incredibly expressive and beautiful, and so recognizable it’s in a class of its own – “The 3 a.m. Voice” – if you woke up at 3 o’clock in the morning and heard his voice on the radio, you’d know instantly who it is. I first worked with him on the 2006 production of The Italian Girl in Algiers, with the amazing mezzo soprano, Stephanie Blythe – talk about operatic musical heaven! – and this production of Gluck’s Orpheus and Eurydice (with the gorgeous soprano, Davinia Rodriguez) would be our 6th show working together. Bill is so easy to work with, treats everyone like a million bucks and he has the distinction of owning two of my opera sock monkeys: Dodge, from Amelia, and Edgardo from Lucia di Lamermoor. 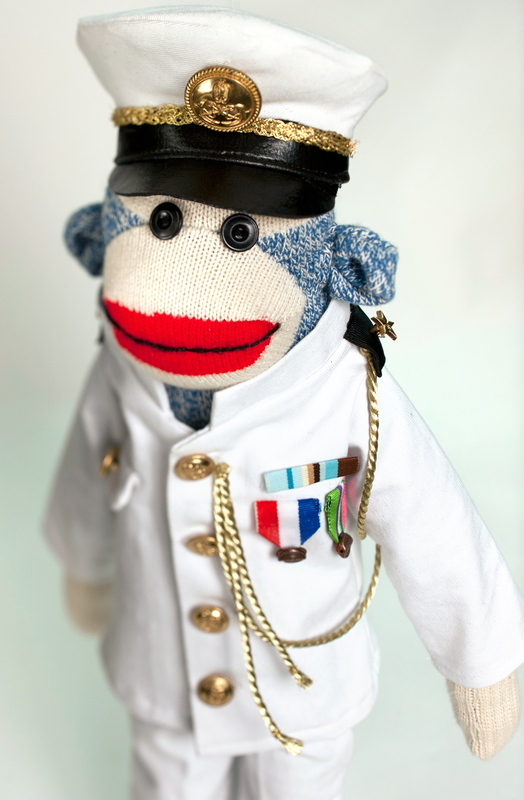 For several weeks I’d been wondering what to do as a momento of the show for him, figuring a 3rd sock monkey would take it from cool to lame/overkill real fast. I mean how many sock monkeys does an opera star really need, even if I did make them? Barbie doll's "Gay Parisienne", stock #964 in original packaging. This is one of the rarest of all Barbie costumes as it was only made in 1959, the year Barbie was introduced. You probably remember from reading my bio (you have read it, haven’t you? 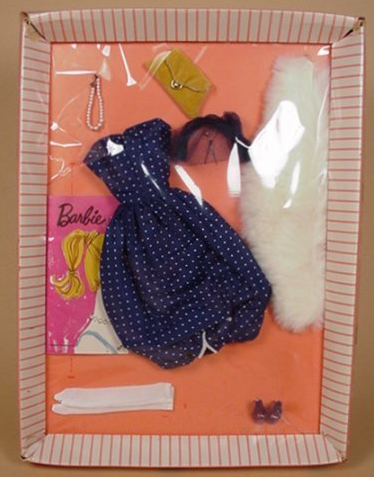 ), that I have a background in collecting vintage Barbie doll stuff and used to write for magazines about it. One of the things that still floats my boat about vintage Barbie, are the amazing clothing ensembles from the 1960s still in their original packaging. Mattel was on the cutting edge of marketing toys to kids in the ’50s and ’60s, and when you look at the way this stuff was packaged, no wonder kids had to have it! I remember walking down the Barbie aisle of the Giant T Drugstore or Valu-Mart and being overwhelmed by the dazzling display of Barbie clothes in those striped boxes hanging from the wall and how they were just waiting to be ripped open! It got me thinking, why not just give Bill a “fashion” for one of his existing monkeys? His costume as Orpheus was really basic – white jeans and a white tunic – so the magic of what I wanted to do was going to be in the accessories. Anyone who collects vintage dolls or action figures knows that assembling the accessories to an outfit is the fun/frustrating part and what can really make the cost skyrocket. Focusing on the accessories also let me get crafty, which I love too. I decided Orpheus would need his tunic (he had white pants for “Dodge”), medallion, lyre, golden apple and blindfold. 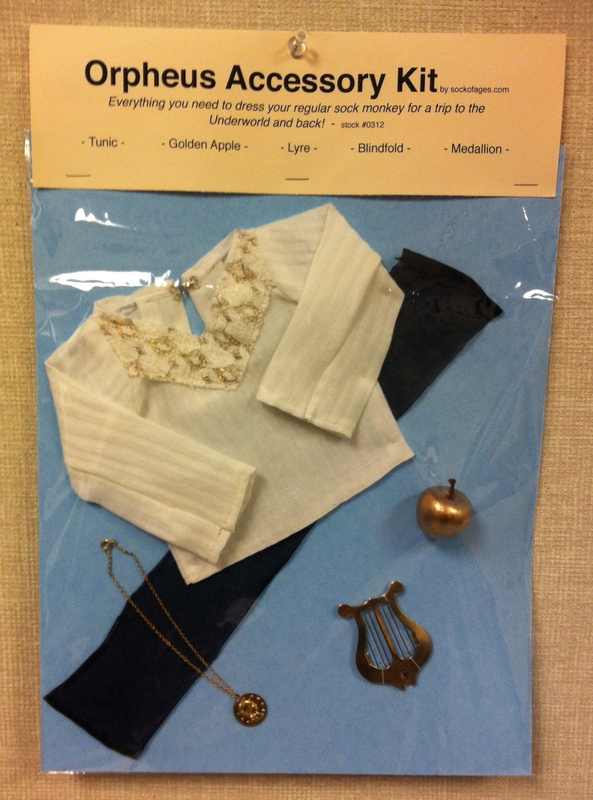 And, I wanted the tunic, medallion and blindfold to be correctly scaled so the monkey could actually wear them if they ever came out of the package – yeah, I know, a bit too obsessive, but look at the stuff I make! Bill's 1st sock monkey - "Dodge"
Medallion: easy – my buddy Marc in the Props Dept. had a drilled gold coin for me to use and I picked up the chain in a thrift store. Golden Apple: easy too – an apple from a faux centerpiece at the thrift store painted gold. Blindfold: easy, but with a bit of work. I ended up using a black sheer nylon because the original black jersey piece I’d made looked too dark and thick when packaged. The sheer reads as “lighter” in the package, and it’s a bit more theatrical and is something we would actually use on stage so a performer could see through it. Tunic: pretty easy because I had leftover scraps from Bill’s actual costume, I just had to sew it together. The most difficult part of the construction was to have it open in back so it could go over a monkey’s head if it needed to. For those of you who sew, I’d like to point out that the opening has a continuous lap placket – something I’ve learned to do recently and am damn proud of having actually done it! I’m using it a lot now because it gives a much more finished look to sock monkey garments (particularly the tail opening in skirts and pants), and it worked out great here. The most fun I had with this was putting it all together. I used blue poster board so the items would stand out more, and blue was used as a predominant costume color in the show. I made a header card with some information about the “product”, and added the stock #0312 – March 2012 – to commemorate the production date, and as an homage to the old doll packaging. The finished piece measures about 11″ x 16″ and is complete with a hole in the header card to hang it for “sale” at the store. I gave it to Bill on closing night of the show and it was nearly as a big a hit as he was. And yes, working on this project made me start hunting for those NRFB (Never Removed From Box) vintage Barbie doll clothes I never had when I was a kid. If only I’d had a checking account when I was five years old…..